After the double glazed windows are delivered to your home or the construction site, ideally they should be installed as soon as possible, to minimise the risk of accidental damage. However, we understand that this may not be practical if there are other renovation or construction work being completed - in this case, it is best to store the double glazed window/ door frames and glass separately and in an area with limited access, (not in the hallway) so that the window frames and insulated glass units experience the least movement possible. This is particularly important with glass, which apart from additional safety concerns, also requires extra care because any glass or insulated glass units broken or damaged after delivery will have to be re-ordered and paid for by customer. If there are unexpected issues that prevent a timely installation of new or replacement double glazed windows and doors, we may be able to arrange for glass to be delivered later than the frames, decreasing the risk of accidental breakage. Ideally, the window and door frames and insulated glass units, should be stored indoors or undercover in a safe area (that has no child access). The protective sticker on the double glazed window and door frame should not be removed while in storage, since it shields the profile from scratches and dirt. Consider covering the double glazed window and door frames with rugs to prevent further damage. Glass and IGUs can also be covered with rugs, but everyone must be able to identify there is glass underneath! Double Glazed Windows and Doors recommend storage of glass on an A frame & that the racking is stable, regularly inspected, glass is properly fastened and weight does not exceed the maximum loading capacity. If this is not possible, storing glass and IGUs vertically, with supported edges is another option, and especially for toughened glass, ensure no contact with hard materials. In addition, it is important to have a well-lit area, clearly defined passageways and cause minimal inconvenience to people working on the site. Ideally, glass and insulating glass units should be stored in a clean, dry environment with sufficient circulation of cool dry air, in order to prevent staining and marking. Storing in direct sunlight is not recommended, as some glass is susceptible to thermal breakage. If glass is delivered on a rainy day and becomes wet, the panels should be dried and restacked with separators, to maximise airflow. 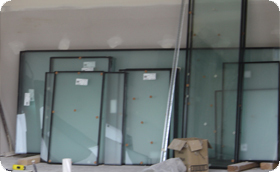 Lastly, protect your glass and IGUs from site contamination caused by building materials. Remember that all our double glazed window and door frames are reinforced with metal inside, and are fitted with hardware, so this considerably changes their weight! Generally, size and weight are positively linearly related, so the bigger the double glazed window or door, the heavier it will be, and care needs to be taken when attempting to move them. Where your builder or project manager is in charge of installation, they should ensure that the team are trained in safe handling and unpacking of glass and. IGUs.